IFPress reports the sad news that Celeste Templeman has passed away. David Tennant rang her in January. 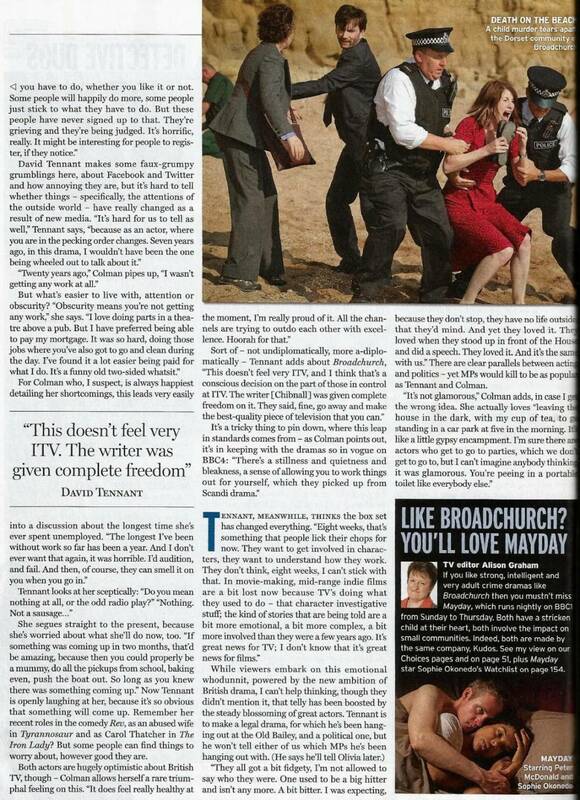 ThisIsSomerset has an article about Broadchurch being filmed in Shepton Mallet last year. It seems likely that David Tennant and Olivia Colman's interview with Richard Arnold will be shown on ITV's Daybreak on Monday morning. ITV have posted David Tennant interview #2 about Broadchurch to YouTube. Backstage and audience information about David Tennant in Richard II at The Barbican Centre. The David Tennant Daily News Digest for Wednesday 27th February. MP3 of a review of Broadchurch from the BBC Radio Four show Front Row tonight. They also compare it to BBC One's drama Mayday. The Yate Gazette has an article about Broadchurch being filmed in Yate. CultBox gives the first episode of Broadchurch five stars and concludes "This first episode reeks of quality in every department and is almost reminiscent of David Lynch's cult series, Twin Peaks. Though in style it's quite different, the mystery, the characters and the slight oddness marks it from your normal television detective drama. Chris Chibnall may just have something huge and iconic on his hands." TV Choice's Letter Of The Week praises both Penguins - Spy In The Huddle and David Tennant. The David Tennant Daily News Digest for Tuesday 26th February. The Doctors Revisited - The Third Doctor will premiere on BBC America in the US on Sunday 31st March at 8pm EST. There are expected to be David Tennant interview clips in the documentary. We've passed another 10,000 milestone today as we have 130,000 people following our account on Twitter! Filming for The Escape Artist continues today on Chorleywood Common near Shepherds Bridge and the Golf Club. The Telegraph reports that the play Rowan Atkinson is starring in (Quartermaine's Terms) has beaten David Tennant's record for best weekly sales at the Wyndham Theatre. However the Telegraph does not mention that Rowan's tickets are more expensive. Dorset Tourism have an article about some of the filming locations in their area for Broadchurch. ITV reports that David Tennant is one of the stars to appear in a Comic Relief special of The Beano which is on sale from today. Also appearing are One Direction, Jessie J and Olly Murs. Scans of David Tennant's interview in Time Out which has different photos to the online version. 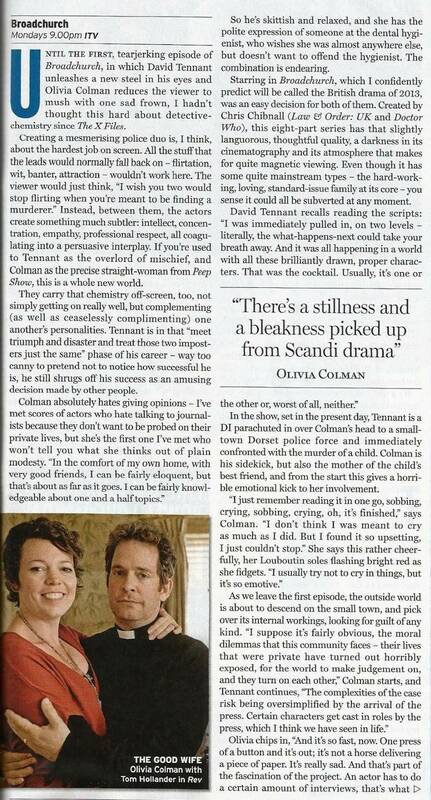 Review of Broadchurch by Time Out. DoctorWhoTV has an article (using quotes from his Time Out interview) titled "David Tennant 'Giving up hope' for his return for Doctor Who 50th." The consolidated figures of episode one of Penguins - Spy In The Huddle was that it received 8.7 million viewers. This figures includes the Sunday repeat but not iPlayer. ITV have tweeted a photo of director James Strong chatting with Olivia Colman and David Tennant on the set of Broadchurch. The Royal Shakespeare Company have posted the ticket prices and performance schedule for Richard II at The Barbican Centre. It is the same as we posted on Saturday but they have confirmed to us that Saturday 7th December will not go on sale when booking starts next week. David Tennant interview at Time Out where he talks about Broadchurch, theatre and career choices. Watford Observer has an article about David Tennant filming The Escape Artist at Chorleywood Common today. Review by The Cardiffian of Penguins - Spy In The Huddle. The final episode of Penguins - Spy In The Huddle last night received 3.92 million viewers (which was a 16.3% share of those watching television at that time) which unfortunately was less viewers than the previous two episodes. Fans on Digital Spy have voted that they would like a multiple Doctor story for Doctor Who's 50th anniversary to include David Tennant. Radio Times - front cover, first page, second page, third page. TV Times - front cover, first page, second page. TV & Satellite Week - front cover, first page, second page. 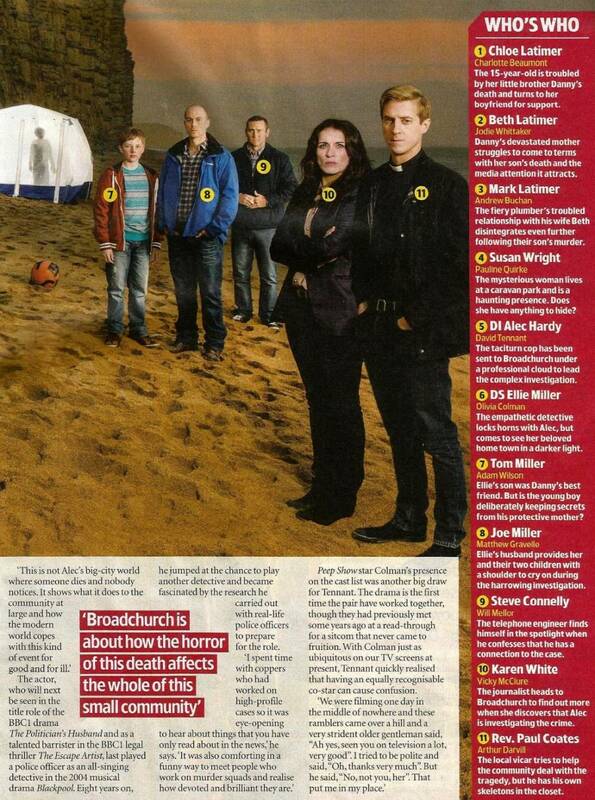 TV Choice - first page. What's On TV? - first page. The David Tennant Daily News Digest for Monday 25th February. 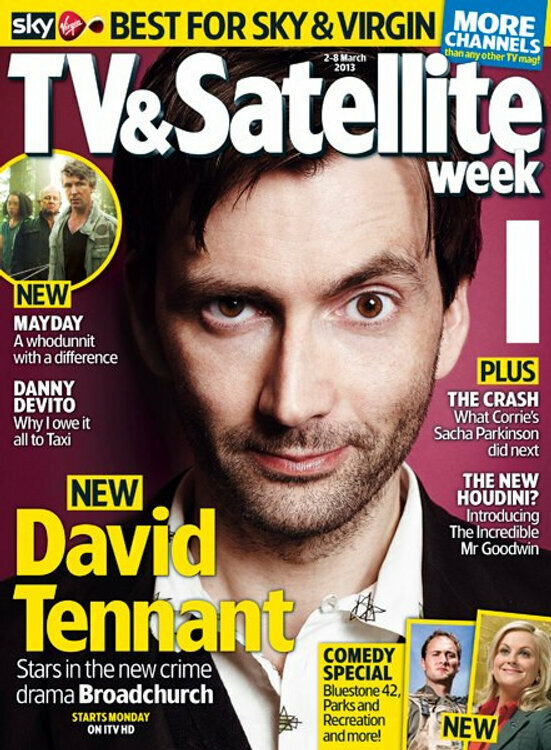 As well as the four magazines we have already mentioned, David Tennant is also the cover photo on TV Guide magazine. Worldwide link to download third and final part of Penguins - Spy In The Huddle. iPlayer link (UK only) to download third and final part of Penguins - Spy In The Huddle. It's not confirmed but David Tennant is likely to be filming The Escape Artist in Chorleywood today. Due to Broadchurch starting next Monday, David Tennant is on the front cover of all four of the major TV listings magazines which were published today - Radio Times, TV Times, TV Choice and TV & Satellite Week. This is a photo of him on the cover of the latter. The Sun has extracts from an interview with David Tennant about The Politician's Husband and Broadchurch. David Tennant / Richard II posters are now available from the Royal Shakespeare Company online shop for only �5. This Is Bristol reports that The Pirates! In An Adventure With Scientists won Best Film at the RTS West Awards last night. The Royal Shakespeare Company have announced that Paul Englishby will compose the music for Richard II. A new advert for Broadchurch was first shown on ITV at lunchtime today. The majority of it was from the previous trailer but it was slightly extended and ended with a shot of David looking directly into the camera at a press conference. The Mirror has printed a preview of Penguins - Spy In The Huddle tonight. Costume designer Ray Holman has tweeted the first photo of a moving digital poster for Broadhurch. The David Tennant Daily News Digest for Sunday 24th February. Unfortunately The Pirates! In An Adventure With Scientists movie did not win at the Oscars as Brave won the Best Animated Feature Award. Episode three of Penguins - Spy In The Huddle premieres on BBC One tonight at 9pm. A synopsis of this episode is here. 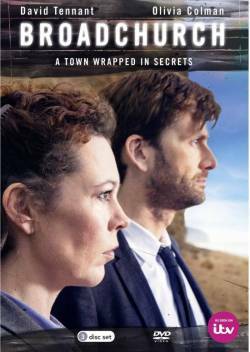 ITV have posted the first of a series of interviews with David Tennant and Olivia Colman about Broadchurch to YouTube. 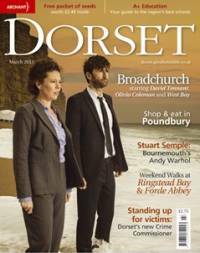 There is a photo of David Tennant from Broadchurch on the front cover of the current issue of Dorset Magazine. The David Tennant Daily News Digest for Saturday 23rd February. David Tennant's Perfect Weekend (from The Times). The Oscars are announced tonight. The Pirates! In An Adventure With Scientists is nominated for the Best Animated Feature Oscar. The Doctors Revisited: 2nd Doctor premieres on BBC America in the US at 8pm tonight. David Tennant is interviewed during the documentary. The RTS West Of England Awards are announced tonight. The Pirates! In An Adventure With Scientists movie has been nominated for the Best Film Award. David Tennant Quiz #132 (hosted by @DTQuiz) is at 6pm today about the Doctor Who episode New Earth. The Radio Times has reviewed the final part of Penguins - Spy In The Huddle. Broadchurch was reviewed on the BBC Radio Four programme Saturday Review from 7.15pm today. The reviewers were Tom Sutcliffe and guests artist Grayson Perry, playwright Laura Wade and writer Susan Jeffreys. Click here for a MP3 of the six minute review but they all enjoyed the drama and said that they would be watching the series. The MP3 contains a clip of the drama. The first part of it is from the video posted yesterday but this audio is slightly longer. The website of the Royal Shakespeare Company now lists a Richard II performance for Saturday 7th December. This was previously listed by the RSC and then removed. It is not listed on the Barbican Centre website. A cast driver, Hefin Jones, has posted a new picture of David Tennant on the set of The Escape Artist. The latest Barbican newsletter for its members says that Michael Pennington will play John of Gaunt in Richard II and that booking at The Barbican for RSC Shakespeare Supporters will start on Tuesday 5th March. Also at The Barbican there will be 10 seats for �5 at each performance for people aged between 16 and 25, plus 30 stalls tickets for only �10 for each performance which will go on sale at 10.30am at The Barbican each day. These day seats will be limited to one per person. All other tickets at The Barbican will be �55, �45, �35 and �25. There are no reduced prices before the Press Night. At 11.30am today Olivia Colman was a guest on The Graham Norton Show on BBC Radio Two to promote Broadchurch. In the second section (MP3 here) Olivia talks about having her knee put out in Broadchurch towards the start of the clip and then they took questions from listeners. The final question was about the Broadchurch posters. The David Tennant Daily News Digest for Friday 22nd February. An article in The Telegraph about theatre membership schemes mentions the high RSC membership sales to buy tickets for David Tennant's production of Richard II. However there are still lots of tickets available. For example, for the final Stratford-Upon-Avon performance there are 25 in the stalls, 35 in the circle and over 100 in the upper circle currently free. The full transcript of the David Tennant Broadchurch interview in The Times has been posted to Tumblr. David also speaks about Richard II (it says that rehearsals start in August) and Doctor Who. There are two David Tennant related radio items today. Sometime between 10am and 1pm on BBC Radio 2 Olivia Colman will be interviewed on the Graham Norton Show. Also at 7.15pm tonight on BBC Radio 4 the Saturday Review programme will include a discussion about Broadchurch. There will be an interview with David Tennant in The Times tomorrow to promote Broadchurch. 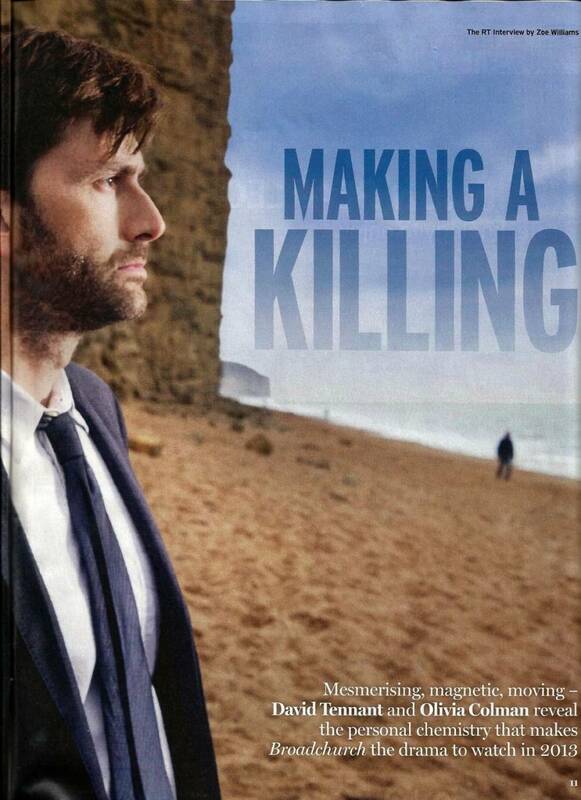 Tomorrow on BBC Radio 4 at 7.15pm the programme Saturday Review features a discussion about Broadchurch. A new clip of Broadchurch has been posted to YouTube. According to makers Acorn Media the Broadchurch DVD will be a 3-DVD set. They are currently selling it for �19.99 including postage. 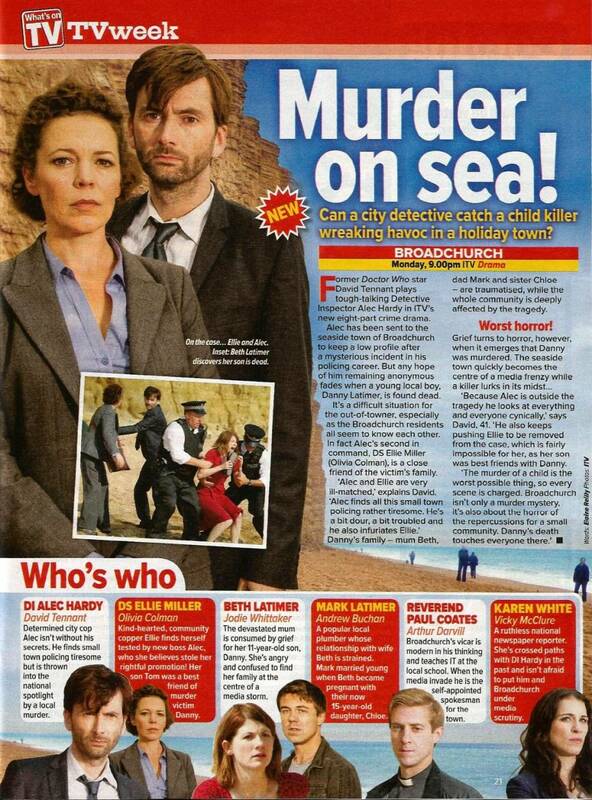 An article in The Sun includes David Tennant and Olivia Colman Broadchurch press release quotes. Amazon have posted the front cover of the Broadchurch DVD. It is released on 27th May. The David Tennant Daily News Digest for Thursday 21st February. Artistic Director of the Royal Shakespeare Company Gregory Doran describes David Tennant as a "great actor" and "extremely hard-working" in an interview with the Oxford Student Union. It was announced that at the end of Broadchurch there will be no 'next time' trailer to keep the suspense so, out of respect to the cast and crew, at DavidTennantOnTwitter.com we will only post a synopsis the day that each new episode premieres. It will be clearly marked so that fans in other countries can avoid the spoilers. David Tennant's Broadchurch co-star Olivia Colman will be a guest on Graham Norton's Radio Two Show on Saturday (23rd). The programme is from 10am until 1pm and can be heard worldwide at this link. In the past 24 hours lots of website and press have posted items about Broadchurch starting on 4th March and included a link to the official trailer. Two examples are UnrealityTV.co.uk and The Telegraph. Happy anniversary to @David_Tennant! We've been on Twitter 4 years today!!! The David Tennant Daily News Digest for Wednesday 20th February. 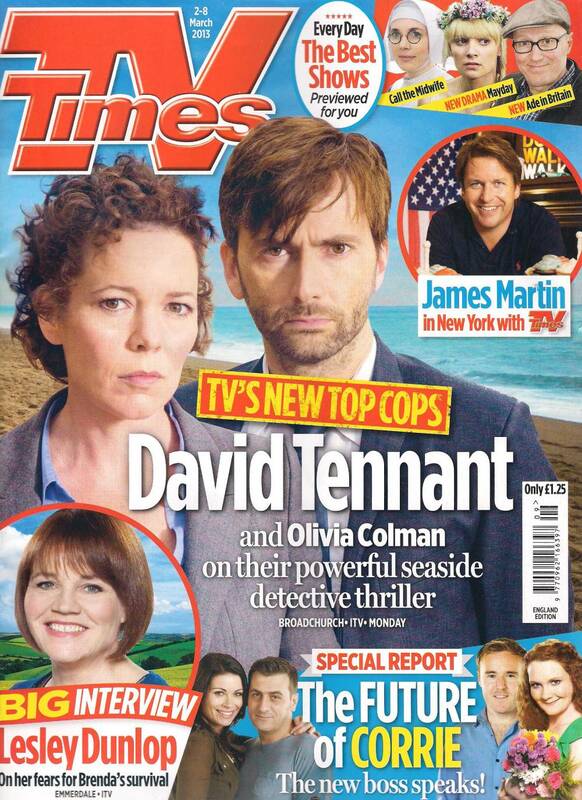 It seems that David Tennant will be on the front cover of next week's Radio Times (and most likely other television listings magazines too) in regards to Broadchurch! The ITV Press Centre has confirmed that Broadchurch will start on Monday 4th March at 9pm on ITV. 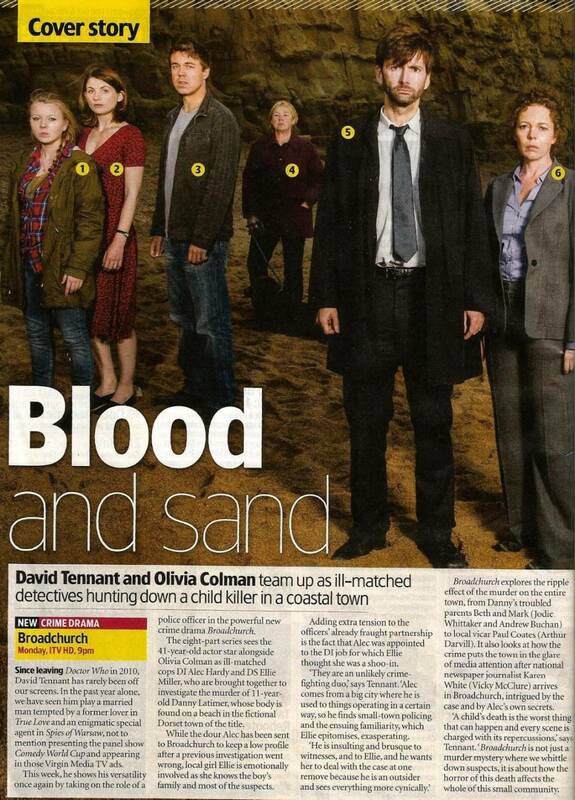 BridportNews.co.uk has an article about the Bridport and BAFTA screenings of Broadchurch. The Royal Shakespeare Company has confirmed to us that Thursday 12th December is the London Press Night for Richard II. The performance starts at 7pm that evening. The RSC has also told us that Wednesday 15th January is a rare London weekday matinee performance and not an understudy performance. This confirms that David will play 85 performances in total - 39 in Stratford-Upon-Avon and 46 in London. David Tennant is mentioned in this week's Radio Times Letter Of The Week. Penguins - Spy In The Huddle was the fourth most watched programme of last week for people between the ages of 18 and 49 as it received 6.5 million viewers between the two broadcasts. The David Tennant Daily News Digest for Tuesday 19th February. A close-up photo of David Tennant from tonight's Broadchurch screening. 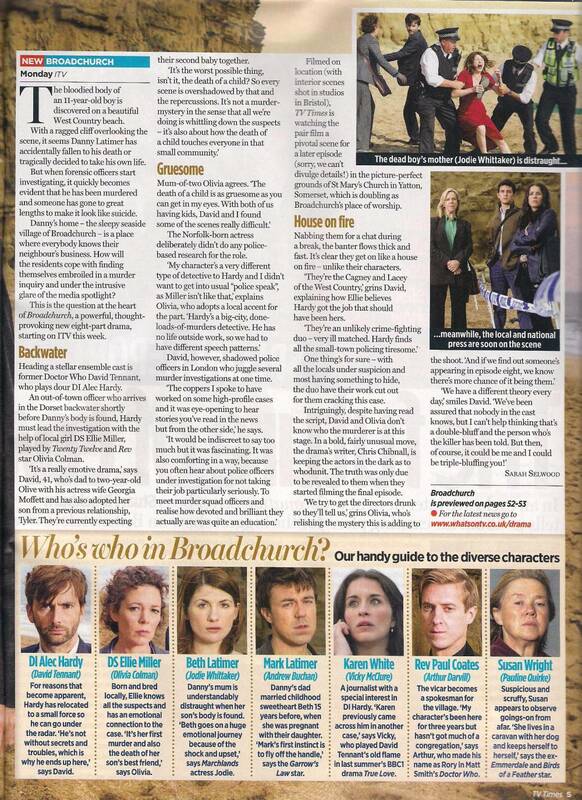 There's a new interview with David Tennant and other Broadchurch cast and crew in The Independent. The paper says that Bbroadchurch will start on Monday 4th March. At the Broadchurch screening tonight David Tennant again said that he knows nothing about any Doctor Who 50th anniversary plans. The first photo from the Broadchurch screening which was posted onto Twitter. From a few tweets posted during the Broadchurch screening David Tennant said that he was drawn to the project by the strength of Chibnall's script and the personnel involved. He also said that a lot of his decision was based on the script and then joked that he would have been really angry if John Simm had got the part! Although it was announced in advance, David Tennant will now attend the BAFTA screening and Q&A tonight. 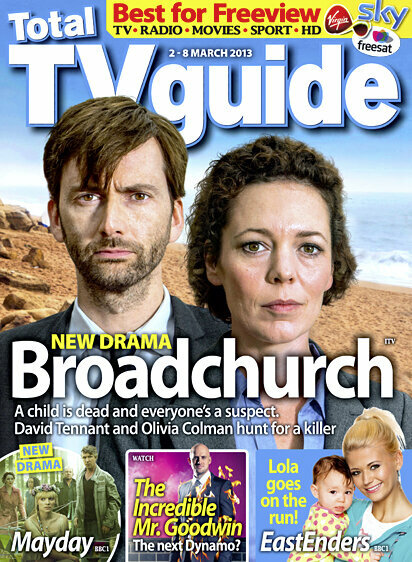 Both David Tennant and Broadchurch are mentioned in an interview with Tracey Childs on TheGoodReview.co.uk. A worldwide link to watch episode 2 of Penguins - Spy In The Huddle. Last night the second episode of Penguins - Spy In The Huddle received 4.9 million viewers which was 300,000 more than last week! It was a 20% share of those people watching television at that time. The David Tennant Daily News Digest for Monday 18th February. Tonight in London there is the BAFTA preview screening of Broadchurch followed by a Q&A. The iPlayer link (UK only) to download episode two of Penguins - Spy In The Huddle. #penguins was trending again in the UK while Penguins - Spy In The Huddle was being broadcast tonight. The Mirror has a review of episode two of Penguins - Spy In The Huddle with a (sad) minor spoiler. Today on the Alan Titchmarsh Show at 3pm on ITV1 John Downer will be talking about Penguins Spy in the Huddle. Jonathan Bailey describes David Tennant as 'brilliant' to work with in Broadchurch in a brief interview in The Sun. The David Tennant Daily News Digest for Sunday 17th February. Unfortunately The Pirates! movie did not win a MPSE Golden Reel Award as Wreck It Ralph won the Sound Editing Award for Animated Movies. Episode two of Penguins - Spy In The Huddle premieres on BBC One tonight at 9pm. A synopsis of this episode is here. It is called First Steps. Tree Fu Magic is released today on region-free DVD. An update on David Tennant filming The Escape Artist this past week. Bleeding Cool say they BELIEVE (believe, NOT know) that David Tennant will be involved in the Doctor Who 50th anniversary based on Steven Moffat's comments at the recent BBC Drama Commissions event which were reported earlier this week by The Mirror. The Daily Express has a review of Penguins - Spy In The Huddle which includes the phrase "David Tennant has a lovely, dry delivery when required." CrimeTimePreview have given Broadchurch 4 stars in their review, although it is not clear how many episodes they have seen. The David Tennant Daily News Digest for Saturday 16th February. The Guardian has a review of Penguins - Spy In The Huddle. The MPSE Golden Reel Awards are announced today. The Pirates! In An Adventure With Scientists is nominated for the Best Sound Editing Award. The David Tennant Quiz #131 (hosted by @DTQuiz) is at 6pm tonight about the Doctor Who episode The Christmas Invasion. Daily Mail has an article about the Emperor penguins' life story from Penguins - Spy In The Huddle with loads of photos. Tree Fu Tom toys are now available in stores in the UK. This photo is from Toys R Us. The toys include one of David Tennant's character Twiggs in an acorn. A photo of David Tennant from filming The Escape Artist today in Islington has been posted to Tumblr. RadioDramaReviews.com has a review of Every Seventh Wave. The Radio Times has an item about upcoming Doctor Who 50th anniversary events, plus there will be two Doctor Who Proms in July. The David Tennant Daily News Digest for Friday 15th February. The dates and times for Richard II at The Barbican Centre have been added to the Royal Shakespeare Company website. Tickets are on sale from 7th March. David Tennant will play 46 performances of Richard II at The Barbican Centre (assuming there are no understudy performances) so he will play 85 in total. Based on the earlier start time it seems that Thursday 12th December will be the London Press Night. Even more press have the story about all 11 Doctors in a Doctor Who 50th anniversary episode. STV has the title 'David Tennant to return to Dr Who?' All of these are bassed on the original Mirror story and nothing has been confirmed. The first preview clip from the second episode of Penguins - Spy In The Huddle has been posted to YouTube. A new official Doctor Who figurines website has been opened which includes a magazine. There is a David Tennant's Tenth Doctor figurine. Based on The Mirror story, The Independent has a Doctor Who article titled "Plans mooted for all surviving Doctor Who actors to reunite for 50th anniversary show." The David Tennant Daily News Digest for Thursday 14th February. David Tennant / Tenth Doctor are featured in a new comedy called Doctor U in Salt Lake City. The Telegraph brings up Jonathan Miller's 2008 quotes about David Tennant and 'celebrity casting' again. This time it is in an item about Rufus Sewell. The station Watch starts repeating Series Four of Doctor Who from today. The Mirror has a story where it CLAIMS that not only all the Doctors (including David Tennant) will be back for the 50th anniversary but also that Matt Smith will regenerate in that episode. The MP3 of the drama has been added to the Every Seventh Wave page. The Huddersfield Examiner has an interview with Jodie Whittaker about Broadchurch. Last weekend (8th to 10th February) Nativity 2 Danger In The Manger! took �641 as it was only shown in 13 cinemas. (It is a Xmas movie!) The total for the 12 weeks since it was released is �9,131,251. 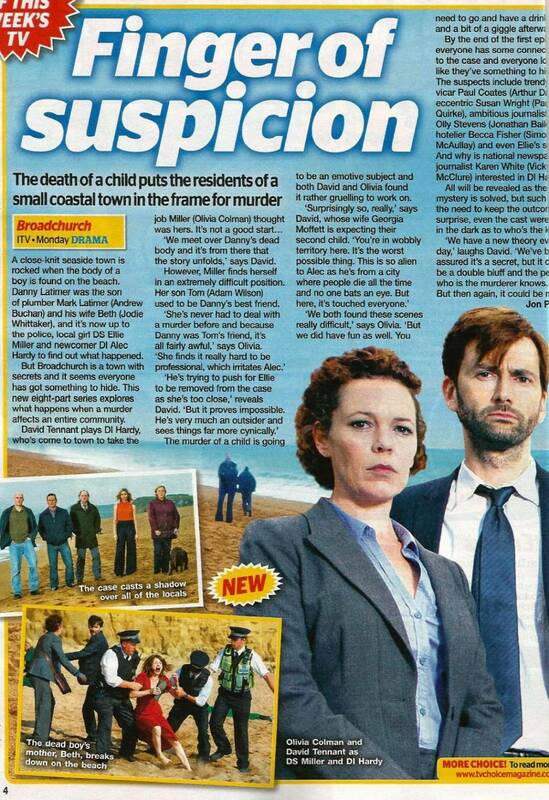 The Bridport News has an article about Broadchurch in the town. The David Tennant Daily News Digest for Wednesday 13th February. The Radio Times has reviewed Every Seventh Wave. Every Seventh Wave premieres on BBC Radio Four at 2.15pm today. 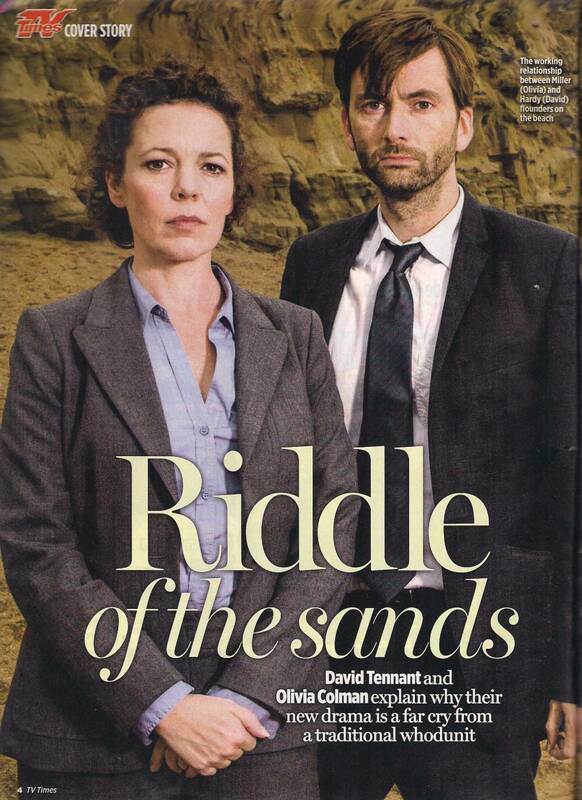 The Radio Times has a new gallery of photos from Broadchurch including several of David Tennant. 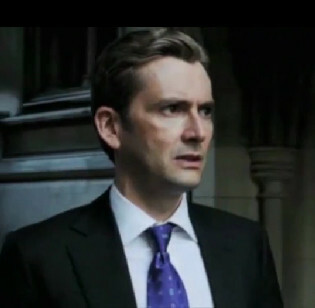 David Tennant is currently filming The Escape Artist in Kingston-Upon-Thames. Filming is expected to continue there all week. The David Tennant Daily News Digest for Tuesday 12th February. The Doctor Who News website has confirmed that David Tennant will be interviewed during the BBC America programme Doctor Who Revisited: The Second Doctor which airs in the US on Sunday 24th February at 8pm. Booking opens at 10am today for RSC Full Members (phone) for Richard II in Stratford-Upon-Avon. The BBC iPlayer link (UK only) for the first episode of Penguins - Spy In The Huddle, plus a worldwide link to watch or download the programme. BAFTA have emailed to say that they have a large waiting list for the 19th February screening of Broadchurch and they request that any members with spare seats they will not use to contact them. The first (short!) clip of David Tennant from The Politician's Husband is included in the BBC drama showreel which was posted online today. MediaTel reports that the first episode last night of Penguins Spy In The Huddle received 4.6 million viewers (overnights) which was a 18% share of those watching television at that time. The Shropshire Star has a great review of Penguins - Spy In The Huddle. The Huffington Post has a more favourable review (with photos) of Penguins - Spy In The Huddle. The David Tennant Daily News Digest for Monday 11th February. Although Penguins - Spy In The Huddle was the third top trending topic in the UK during its broadcast, so far only one newspaper has posted a review online. Unfortunately The Guardian complains about David Tennant's narration but appears to forget that he was reading a script. The Radio Times which is published today contains the Doctor Who postcards including one of David Tennant. For those not able to buy priority booking tickets yet to see Richard II, there are still over 184 tickets remaining for the final performance in Stratford-Upon-Avon for example. The RSC told us today that the 13th November performance of Richard II is not confirmed which is why it did not go on sale yet. Due to the popularity of the announcement of him appearing in Richard II, Lyn Gardner of The Guardian believes that David Tennant reading the telephone directory on stage would sell out! The Broadchurch DVD is now available to pre-order from this link on Amazon. It will be a 3-DVD set which will be released in the UK on Monday 27th May. The Radio Times website also has an article about Penguins - Spy In The Huddle. The Radio Times has an article about the Doctor Who postcards (including one of David Tennant) which will be in their which is issue published tomorrow. Tickets for the Press Night for Richard II on Thursday 17th October will not be going on sale at 10am. Usually Press Night tickets go on sale later once The RSC know how many of the press will be attending. The David Tennant Daily News Digest for Sunday 10th February. John Downer will be interviewed today on BBC Radio Scotland at 8.15am and on Radio 5 Live at 8.55am about Penguins - Spy In The Huddle. Penguins - Spy In The Huddle is the Mirror's Mondays Must See TV. Episode one of Penguins - Spy In The Huddle premieres on BBC One at 9pm tonight. The first episode is called The Journey and a synopsis is here. Booking opens at 10am today for RSC Full Members (online) for Richard II in Stratford-Upon-Avon. Worldwide link to watch the Broadchurch trailer. Some screencaps from the Broadchurch trailer which premiered tonight have been posted onto Tumblr. A photo of the first Broadchurch poster has been posted onto Twitter. According to the Broadchurch trailer, the 8 part drama will start in March. The first photo of David Tennant on the set of The Escape Artist has been posted onto Twitter. The person who posted tweeted that the drama will air in the Autumn. The CBBC Newsround website has an item on the making of Penguins - Spy In The Huddle. There will be a free screening of the Human Nature episode of Doctor Who in Chicago on Saturday 23rd February. Tickets can be booked at this link. Series Four of Doctor Who will start being repeated on the satellite station Watch from Friday 15th February. The David Tennant Daily News Digest for Saturday 9th February. According to a tweet posted yesterday, David Tennant fiilmed a scene for The Escape Artist in a horse yard near Cranleigh in Surrey on Thursday and Friday. In a poll of only 1,200 voters the Radio Times reports that Doctor Who Confidential has been voted the Best BBC3 Show Of All Time. The Royal Shakespeare Company website is showing one less performance of Richard II as Wednesday 13th November has been removed. Some people believe that it might it be due to the Doctor Who 50th anniversary but it could equally be due to a corporate or private performance. The first dedicated Broadchurch trailer will be broadcast tonight immediately after Mr Selfridge on ITV (i.e. just before 10pm). David Tennant Quiz #130 (hosted by @DTQuiz) is at 6pm today. It is Complete This Line From Series 4 Of Doctor Who. The Mirror has an interesting article about the making of Penguins - Spy In The Huddle. New clips of David Tennant in Broadchurch are shown in the new ITV trailer called Where Life Lives, It also includes the first chance to hear David Tennant using his own accent as this character. In an article which was only posted online today although the screening was last Wednesday, the Bridport News reports that Broadchurch writer Chris Chibnall described David Tennant as "versatile." The David Tennant Daily News Digest for Friday 8th February. A new clip from Penquins - Spy In The Huddle (which had narration by David Tennant) was shown before John Downer's interview today on BBC One Breakfast. It seems that the promo has started for the movie Postman Pat: You Know You�re The One as The Express has a short interview with Stephen Mangan. The iPlayer link (UK only) for the BBC Points West interview yesterday with John Downer about Penquins - Spy In The Huddle. It starts at 21 minutes. On BBC Breakfast today sometime between 8.50am and 9.50am today on BBC 1 John Downer will be talking about Penguins - Spy In The Huddle. Penguins - Spy In The Huddle is one of Yahoo TV's TV highlights for this coming week. One part reads "David Tennant is a charming narrator as we learn about the Emperors in the Antarctic this week." A little tidbit about Broadchurch is that David Tennant uses his own Scottish accent in the drama. In the ITV press kit he says that he presumes his character comes from Glasgow. Richard Stokes also tweeted that Broadchurch posters will go up across the nation on Monday. Richard Stokes tweeted that the first dedicated Broadchurch trailer will be broadcast immediately after Mr Selfridge on ITV on Sunday (i.e. just before 10pm). John Downer will be interviewed on the local programme BBC Points West tonight about Penguins - Spy in the Huddle at 6.30pm on BBC 1. BBC Radio Four's website now has a page for Every Seventh Wave which airs next Thursday. The David Tennant Daily News Digest for Thursday 7th February. The Royal Shakespeare Company have posted onto their website the email they sent to Full Members yesterday about booking tickets to Richard II on Monday. WETA has a preview video of Shakespeare Uncovered which plays worldwide. Amazon lists the DVD of The Politician's Husband with a release date of 29th April. However there is no pre-order link or cover photo yet. The BBC have not announced yet when the three part series will be broadcast. David Tennant's episode of Shakespeare Uncovered has its first US broadcast on PBS tonight at 9pm. In an article in the Huffington Post David Morrissey talks about how he and David Tennant were worried about the reception Blackpool would receive before it aired! Last weekend (1st to 3rd February) Nativity 2 Danger In The Manger! took �1,275 in 20 cinemas despite it being a Xmas movie. The total for the 11 weeks since it was released is �9,130,584. Full members of the Royal Shakespeare Company have received an email saying they expect the website to be busy on Monday (when their booking period opens) but there are lots of tickets available (we calculated that there will be over 86,000 in total). They also recommend that people check that their login works properly before Monday. WessexFM has posted a MP3 of Richard Stokes talking about filming Broadchurch in the area and about the drama. The Bridport News writes about the "spellbound audience" at the screening of Broadchurch last night. The Chris Chibnall interview in the ITV press pack for Broadchurch has an amusing anecdote about David Tennant. The David Tennant Daily News Digest for Wednesday 6th February. Twenty Twelve has been nominated for the Best Entertainment / Comedy Award in the Broadcasting Press Guild Awards reports The Guardian. The other nominees are Fresh Meat and The Thick of It. Also Olivia Colman has been nominated for the Best Actress Award and John Morton for the BPG Writer's Award. The BPG awards are voted for by journalists who write about TV and radio and the winners will be announced at One Whitehall Place in London on Thursday 14th March. Booking opens at 10am today for Shakespeare's Circle Members for Richard II in Stratford-Upon-Avon. ITV have published their press pack for Broadchurch. It includes an interview with David Tennant. Unfortunately Tree Fu Tom did not win the Best Preschool Animated Series Award at the Kidscreen 2013 Awards today in New York City as Daniel Tiger's Neighborhood won instead. At the Broadchurch screening tonight, they confirmed that the broadcast date had not been set yet but expected that it would be late February / early March. After the screening tonight in Bridport, the best tweets so far are "Blimey! Just seen Broadchurch episode 1.... A return to proper 'edge of the seat' British drama. Cant wait for the rest." and "No spoilers, but Broadchurch episode one is brilliant. Strong, emotional performances from an impressive cast brought tears to my eyes." John Downer Productions have added two videos from Penguins - Spy In The Huddle. The Guardian's Big Picture today is from Penguins - Spy In The Huddle. 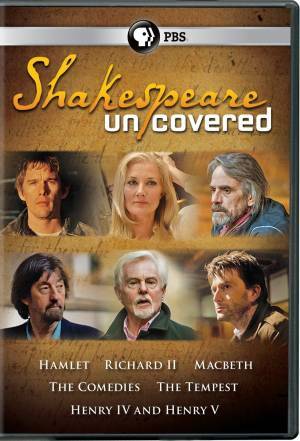 There is a photo of David Tennant on the cover of the US version of the Shakespeare Uncovered DVD. This is the link to pre-order it from Amazon. The DVD is released on 26th March and it airs on PBS on Friday (8th). The David Tennant narrated Twenty Twelve has been nominated for the South Bank Sky Arts Award for Comedy. Also nominated in that category are Alan Partridge: Welcome to the Places of My Life and Hunderby. The winners will be announced at the Dorchester Hotel on Tuesday 12th March. As well as writer Chris Chibnall and director James Strong BAFTA have posted on their website that cast members Olivia Colman and Jodie Whittaker will attend their Broadchurch screening on Tuesday 19th February. Producer Richard Stokes perviously tweeted that he will be there too. The David Tennant Daily News Digest for Tuesday 5th February. The winner of the Best Preschool Animated Series in the Kidscreen 2013 Awards will be announced in New York tonight. Tree Fu Tom is nominated. Tonight there is a screening of Broadchurch at the Bridport Art Centre in Bridport. The event is sold out. Next week's issue of Radio Times will have a free Doctor Who postcards offer. There will be two sets and one of them will include a photo of David Tennant. Some new (old as they are from from April 2011!) photos of David Tennant from his Fright Night / Disney shoot have been posted to GettyImages. A photo of David Tennant's suits for The Escape Artist had been posted onto Tumblr by someone working in the costume department. It has since been removed but someone kindly posted it to PhotoBucket. The wardrobe lady wrote "Everyone else has at the most a little less than half this much wardrobe! He has more suits than we know what to do with, and we keep getting more!" 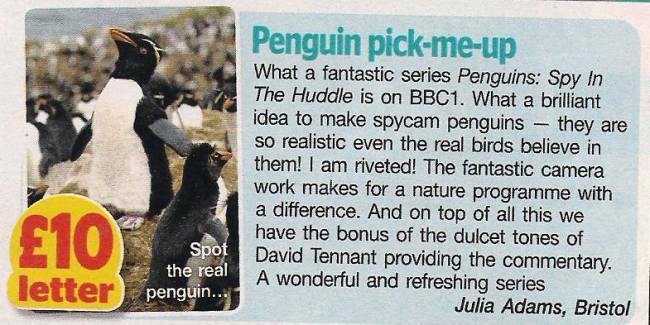 The new issue of TV Times has an interview with John Downer about Penguins - Spy in the Huddle. The Pirates! In An Adventure With Scientists movie has been nominated for the Best Film Award in the RTS West Of England Awards. The winners will be announced at a ceremony at the Bristol Old Vic on Sunday 24th February. The total viewing figures for all four episodes of Spies Of Warsaw in Poland. The David Tennant Daily News Digest for Monday 4th February. A new trailer from Penguins - Spy In The Huddle has been added to YouTube. The page on the John Downer Productions website has now been updated with details about the various cameras they used to make the programme. The Royal Shakespeare Company have announced that they will soon release an iPad app which will feature their Winter Season 2013 including Richard II. 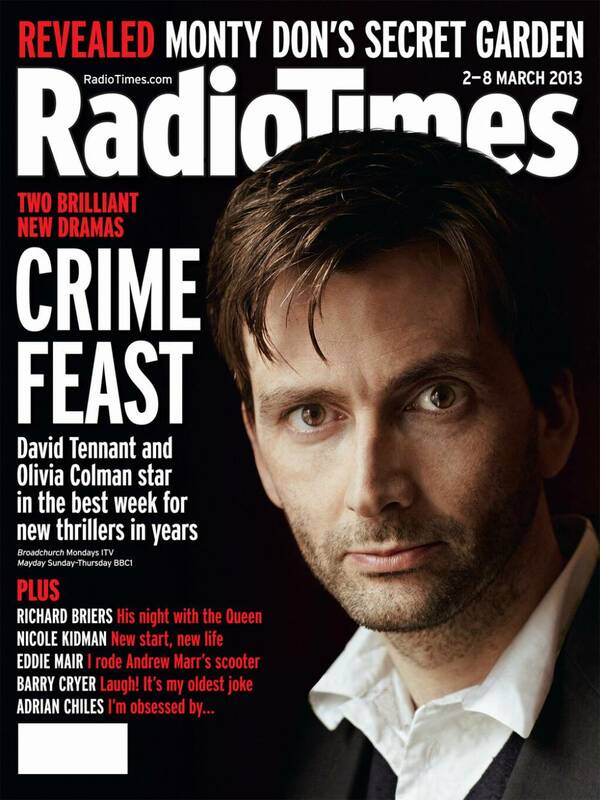 David Tennant is on the front cover of the February issue of the Radio Times Extra magazine. Inside there are short items about both Broadchurch and Penguins - Spy In The Huddle. The David Tennant Daily News Digest for Sunday 3rd February. FifeToday has a review of the DVD of Spies Of Warsaw. A photo of the inside the costume van for The Escape Artist has been posted onto Tumblr. The blogger has also written about pinning a boutonniere onto David Tennant's lapel. The David Tennant Daily News Digest for Saturday 2nd February. The David Tennant Daily News Digest for Friday 1st February. David Tennant was interviewed throughout the BBC America programme Doctors Revisited: The First Doctor which premiered on Sunday 27th January. The video is now available to view worldwide on YouTube. The Sun also has an article today about Penguins - Spy In The Huddle. This article includes several photos and a video. The Daily Mail has a fascinating article about the making of Penguins - Spy In The Huddle. It says that 1,000 hours of penguins were filmed over 300 consecutive days. The Adventures Of Luther Arkwright CD is only �5 on special offer from Big Finish for this weekend only. Maybe because it's a slow news day but the final item on Magic radio's 5pm news tonight was about David Tennant playing Richard II for The RSC which was 9 days after the announcement! The BBC Media Centre website now has a page about Every Seventh Wave which premieres on BBC Radio Four at 2.15pm on Thursday 14th February. Despite it being the end of January, last weekend the Christmas movie Nativity 2 Danger In The Manger! took another �2,143 over 20 cinemas in the UK. It has raised �9,127,075 in the 10 weeks since it was released. Video of David Tennant singing on Daybreak yesterday. The David Tennant Daily News Digest for Thursday 31st January. Episode four of Spies Of Warsaw premieres on TVP1 in Poland tonight. The end of episode three was scene of the family supper in Jean Francois estate when he left the table so wasn't really a cliff-hanger.